The glycemic index is a score that indicates how much a food or beverage raises your blood glucose level. This helps people with diabetes plan their meals to keep blood sugar balanced. It also helps anyone who is watching their weight because high blood sugar triggers insulin and insulin promotes fat storage. Even though peaches are a source of sugar, their glycemic index score lets you know they have a small impact on blood sugar. As your body digests carbohydrates, they're broken down into simple sugars that enter your bloodstream. Some foods release their sugar into your bloodstream quickly and cause a big spike in blood sugar levels. The glycemic index gives you a way to choose foods based on their impact. It measures how much each food boosts blood sugar compared to pure glucose. Foods are assigned a score based on a scale of one to 100, where pure glucose equals 100. 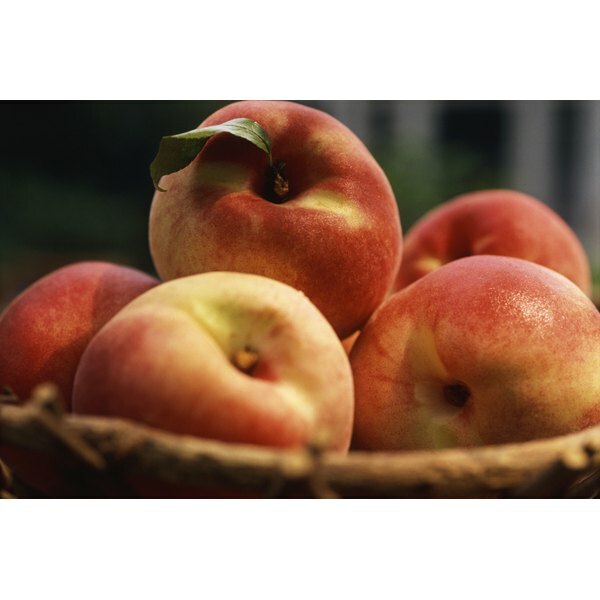 Peaches fall into the category of low glycemic foods. According to the Harvard School of Public Health, a 120 gram serving, which is a small peach, has a glycemic index score of 42. A score of 55 or less is a low glycemic index rating, 56 to 69 is a moderate rating and 70 or above means it's a high glycemic food. Different factors can make the score fluctuate. If you eat a larger piece of fruit, it's impact may be higher and as fruit ripens, the glycemic index goes up. Peaches have a nearly identical glycemic index rating as oranges and grapes, which have GI scores of 42 and 46, respectively. They have a slightly higher GI rating than pears and apples that both score 38 and peaches are slightly lower than bananas at 51. Peaches have a significantly lower GI than watermelon, which scores 72. It is notable that the rating of 42 applies solely to the whole fruit, not to canned peaches or peach-flavored beverage. The glycemic rating can change when a fruit is canned or made into "fruit drink" that contains added sweeteners because they dramatically increase the glycemic index rating. The Harvard School of Public Health notes that the same 120 gram peach that is canned and preserved in a light syrup receives a GI rating of 52. Fruits and sugary sweets or baked goods all contain simple sugars, yet fruits are low on the glycemic index and sweets are high. The reason for the difference is that fruits also contain fiber and fiber moderates the rate at which the natural fruit sugar enters your blood stream. The same concept applies to foods such as white rice, which doesn't contain fiber and has a glycemic score of 89, while fiber-rich brown rice has a score of 50.